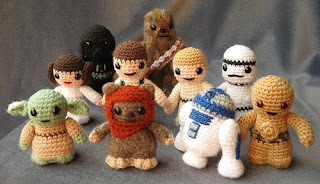 Star Wars, and the craft of crocheting seem like odd bed fellows... until you take a peep at these babies! Ten tiny Star Wars characters, all made by hand by crochet. What talent! Darth Vader, Yoda, Chewbacca -- they're ALL here! Who knew crochet was so cool, and pop culture-esque! Lucyravenscar of England -- you are a GENIUS! You can purchase Lucy's patterns on Esty to make your own Star Wars crochet characters - if you dare! As for me I think it's best that I just admire this fabulous handywork from afar, and leave this unique craft to the professionals! Check out Lucyravenscar's blog for more of her amazing work. I like you will just look at them, not very crafty at all.